Last winter’s heavy rains were not kind to California’s 90-mile Big Sur Coast, most of which is in Monterey County. First the Pfeiffer Canyon Bridge on Highway 1 washed out, cutting off access to all but foot or helicopter traffic south of Big Sur Station. Then one of the largest landslides in California history reshaped the southern portion of the coastline by dumping a mountain of debris 600 feet into the Pacific. The good news is that on Oct. 13, the rebuilt Pfeiffer Canyon Bridge opened 35 miles of coastline that had been cut off for eight months. The Mud Creek slide area won’t be repaired until next summer, so while you still can’t drive straight through from Carmel to San Simeon, there’s plenty for you and your adventurous pup to revisit and explore in between. • Big Sur is all about the views, and there are plenty of vista points and overlooks where you can pull over, absorb yourself in the sounds of crashing surf and screeching gulls, and get some great selfies of you and your pup. But don’t count on it: this stretch of coastline can be very moody in winter. Calm, crystal-clear days that afford breath-taking panoramas are interspersed with foggy, blustery ones, so be prepared for all possibilities. • Spend the night in Big Sur if you can; you’ll enjoy the remote atmosphere and proximity to empty beaches, bright-star nights and crashing surf. 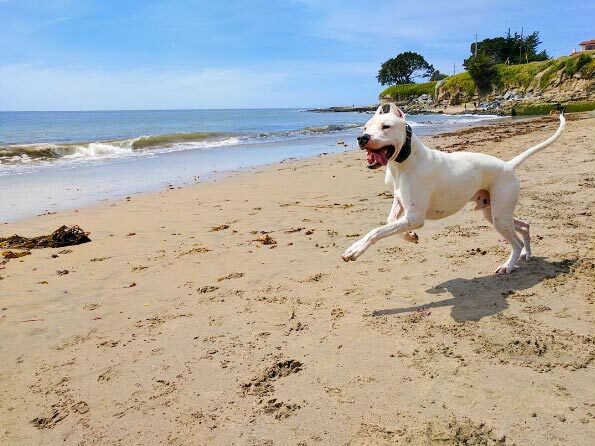 Dog-friendly accommodations in laid-back Big Sur include Big Sur Campground & Cabins, Fernwood Resort, Gorda Springs Resort, and Riverside Campground and Cabins. Look for good off-season deals this winter as business trickles back. • Roam amid redwoods, stroll on the sand. Most Big Sur state parks have partially reopened in the wake of fire and floods that took out hillsides and trails, but don’t look for them to be dog-friendly. Leashed dogs are allowed in “developed areas” (i.e.. parking lots, roads, day-use areas and campgrounds) at Andrew Molera, Limekiln and Pfeiffer Big Sur state parks (the latter of which has some lovely road walks through the redwoods). In addition, canine companions can stroll with you by the sea on Garrapata State Beach, which has no admission charge. 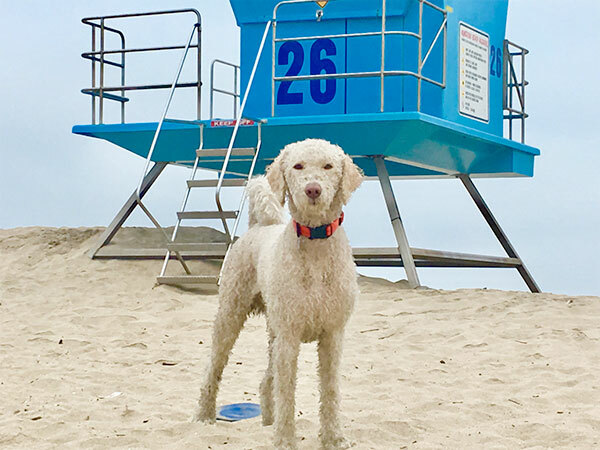 • The rules are much more relaxed on two Big Sur beaches managed by the U.S Forest Service — which, by the way, allows dogs on trails on all the lands it administers. Sand Dollar Beach ($10 day-use fee) is the longest strand on the Big Sur Coast and has a nice bluff-top trail as well as powdery sand for Daisy to sink her paws into (don’t forget to bring a towel!) Pfeiffer Beach ($10, cash-only admission fee) is the enchanting strand with purple sand, sea caves and crashing waves that you’ve seen in many a calendar photograph. It’s accessed via 2-mile Sycamore Canyon Road off Highway 1 between the Big Sur Ranger Station and the post office. • Many Big Sur restaurants allow dogs on their patios, but in winter, not many patios are open. The restaurant (but not the hotel) at Big Sur River Inn & Restaurant is dog-friendly, and afterwards, you can take a hike along the burbling Big Sur River. Make it a point to stop at the Coast Gallery Big Sur and its adjacent café, near the Henry Miller Memorial Library. Rustic buildings crafted from recycled redwood water-storage tanks make the gallery, featuring six rooms and the work of more than 250 American artists and artisans, a work of art in itself. Leashed dogs are allowed inside the gallery and at outdoor café seating.